Check your Facebook News Feed at any given moment and thanks to the wonders of Facebook’s algorithm ninjas you’ll probably find videos in 2-4 (sometimes more) of the top ten posts…which is what you would expect when 100 hours of new video content gets posted to YouTube alone every minute of the day. But let me ask you something: with the continued explosive growth of travel and destination events how many destination videos do you EVER find in your Facebook News Feed? With research clearly indicating that peer recommendations are the most important travel influencer, and that video is the most powerful media format for telling a story or sharing an idea, why then are there so few destination videos being shared and viewed…particularly when social media channels now dominate travel information dissemination? In researching this posting I decided to check out DMO destination video content from about 50 DMOs from all over the world and found that the majority of their videos had less than 5,000 views PER YEAR (many were less than 1,000) while the number over 100,000 per year were very limited. In a world with 1.3 billion active monthly Facebook users where three billion people traveled on airplanes last year alone I find these stats sad…but not entirely startling. Representative: Feature as many destination stakeholder groups (or members) as possible to demonstrate that the DMO is doing something for everyone in the community. Inclusive: Showcase as many activities and experiences as possible to demonstrate that the destination has something that appeals to everyone in the marketplace. All jammed into one video. In some cases you can almost see the fingerprints of councils and committees on the final product to ensure checklist compliance with their prescribed formula. Which begs the question: who is the video really for anyway? Tell a Story: Travel is about an emotional journey as much as a physical one. Its not a commercial shot list. Adopt a unique and differentiated perspective. Create some tension. Create some entertainment. Show some attitude. Check-out Booking.yeah. Use a Different Look and Sound: Great cinematic photography used to be remarkable. Now its standard stuff for everyone. Try another format. How about using a Go-Pro camera to showcase a destination experience? I’d love to see someone use some elements of animation. Use a soundtrack that doesn’t sound like it came from an elevator. The point is to try something different to be purple in a sea of brown. Create Smaller Content Slices: Ditch the mandatory shot list. Research shows that people will watch a video for 2.5 minutes before moving on…as long as you grab them in the first ten seconds. Narrow your scope to one clear message and one emotional takeaway for a very precise audience personae. This will get your run time down and you’ll develop a diverse library of short (less than 30 seconds) story videos which are easily consumed and readily shared. VisitFlorida does a great job with this. Use Different Story-tellers: Most destination videos are told from the generic omnipresent perspective of the destination as in “here’s all what we have to show you and it is good”. Personalization and authenticity rule these days so align your destination stories with the proper story-tellers. If it’s a gastronomic experience, I want the perspective (not just the picture) of a chef or a farmer. If the story is about arts and culture, what do the artists want to share? Tourism Vancouver uses a Chinese musician to engage the Chinese youth market. Tourism Tofino uses an aboriginal surfer-artist to tell its “end of the road” story. Go Deep With Your Audiences: With so much video content available on most destinations, forget trying to cover everything in a staccato of one-second fast cuts. People already know the typical top ten lists. Instead, develop specific video content for the jewels that most don’t know about and won’t learn from anyone else but the DMO. After all…you’re the expert. The Greater Palm Springs CVB has a great selection of local knowledge videos. The power of video to market a destination is unmatched. And now Its easier and cheaper than ever to produce great video content about a destination. But to make it remarkable and relevant in a world of content shock means to think “purple” to avoid being lumped into the endless herd of “brown” stuff already out there. And that usually starts with having the courage to act. 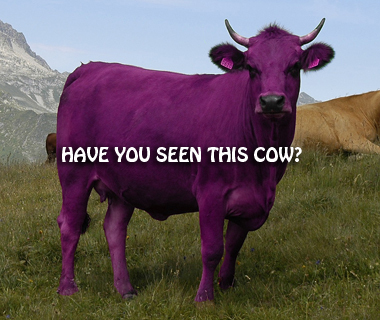 We will be looking for our purple cow! Stay tuned!! We now have a full time video content creator and curator, that is her full time job! thanks again for pushing creativity over being PC! Perfect. That’s what being committed looks like! Hey, thanks for the mention of TVan.